Is Uncle Sam taking too big a bite out of your paycheck? No one wants to pay 30 - 50% of their income, off the top, to someone else, yet that's exactly what middle-class American taxpayers are doing. Everyone wants to pay lower taxes. For most of us, taxes are our single largest expenditure, with the possible exception of a mortgage. Most middle class Americans pay nearly 50% of their income in some form of taxes! By the time you add federal income tax, state income tax, local income tax, sales taxes, gasoline taxes, etc., you're very lucky if you get to keep more than 50% of your income. Each year, we work from January into May JUST to pay our taxes. Only the money we earn from June through December actually makes it into OUR pockets to pay our expenses! because Uncle Sam gets his share first. 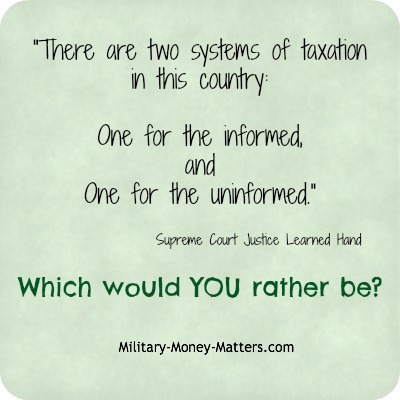 Educate yourself about our tax system. Learn how you, too, can pay lower taxes. and one for the rest of us. And one for the uninformed." Join the ranks of the informed taxpayers, and stop paying more than your fair share! Justice Hand went on to say there is nothing that compels us to pay more taxes than the law requires, and there is nothing wrong with arranging one's affairs in such a way as to pay lower taxes (so long as it's done legally, of course!). The American income tax system has become so complicated, and changes so often, that no one person can possibly know everything in it, not even a tax professional. No one is as familiar with your activities as you are, so no one is better situated than you to know whether your activities qualify for various income tax deductions that would result in lower taxes. Even if you use an accountant, he or she can't tell, simply by looking at the numbers or receipts you provide, whether to recommend additional deductions. YOU have to tell him or her which of those numbers represent deductions and lower taxes. That is why it is critical to your financial future for you to educate yourself as thoroughly as possible about income tax deductions that you can qualify for. VERY few people, even savvy business people, are taking all of the deductions for which they qualify. Why? They don't realize they qualify for more. Even your average tax CPA may not be aware of some of the deductions you're entitled to take. This is especially true of the seasonal tax preparation services. To maximize your deductions and the amount of your money you're able to keep (because you're paying lower taxes), you need to find either a tax attorney or tax CPA (or preferably both, if your business makes enough money) who specializes in tax reduction strategies. They are sometimes called "tax strategists." Think about this: How much better would your financial picture look if you didn't have to pay 30% to 50% of every dollar you make off the top in income taxes? What if you could use that money to pay off your debt, and then invest it for your future? Well, you CAN! It's all about learning how to pay lower taxes and keep more of the money you earn. The largest tax deduction for most individual taxpayers is the interest you pay on a home mortgage. This is one of the biggest benefits of home ownership, because it lowers the amount of income tax you pay and allows you to build a nest egg faster through the equity you build in your home. In addition to the home mortgage interest deduction, one of the best ways to take advantage of the deductions built into the US Tax Code is to own your own business! In these technologically-advanced times, that's not nearly as complicated or expensive as it used to be. And in these economically-uncertain times, it can provide you with financial security. You know you can't be fired or "down-sized," because you're the boss. It's YOUR business! That can feel awfully good these days. There are many different businesses which can be operated from your home, and operating a home-based business can be your ticket to lower taxes, which means more of the money you earn actually stays in your pocket! While an individual pays taxes first, and then can pay his or her expenses out of what's left over, a business pays expenses first, and only pays income tax on what's left over after expenses (profit)! So it pays -- literally -- to learn about all the deductions you can qualify for. And you'd be surprised how many of the expenses you're currently paying as personal expenses (with those after-tax dollars) COULD become business expenses. At the same time, that reduces the amount of income your business pays taxes on, depending on the type of business you own, AND it leaves more cash in your personal pocket that you can use to get your family out of debt and start investing for a more secure financial future. We have a multi-millionaire friend who enlisted in the Air Force years ago. After his tour was over, he went into business for himself, and made a comfortable living. But he decided he wanted to become a millionaire, which he did at age 37 by investing in real estate. He still invests in real estate and has a very profitable business as well. He smiles smugly as he pats his wallet in his back pocket, and refers to his "Hip National Bank." Wouldn't YOU like to have your own "Hip National Bank?" Just to give you an idea how many tax deductions are available for businesses, take a look at this list of more than 250 tax deductions available to small business owners. Here's another tip that many small business people don't realize. Operating your business as a C corporation may actually save you money! Many small business owners shy away from operating their businesses as C corps because they've been warned about something called "double taxation." Double taxation is a problem ONLY if you take money out of the corporation in the form of dividends. But that's not what you want to do. There are so many opportunities afforded by the tax code for you to legally transfer money out of the business in other ways, which usually result in a tax deduction for the business and are not reportable by you as income. You want to learn what those are. Here's another reason a C corp can save you on taxes: A C corp pays just 15% on the first $50,000 of income, but an individual will pay much more than that -- whatever your personal income tax bracket is. So you may want the corporation to earn some of that income rather than earning it personally. Any amount you pay yourself as salary would be a tax deductible expense for the company, so it wouldn't pay taxes on that amount, and you would pay personal income taxes only on the amount that you receive as salary. If you own a business, you owe it to yourself to find out how to pay lower taxes. And if you don't yet own a business, you should start thinking about what hobby, skills or knowledge you have that you could turn into a business! Home-based businesses are perfect for military spouses, who traditionally are paid less than their non-military counterparts by virtue of the fact that they move and change jobs every time their spouse changes duty stations. Think how great it would be to have your own business that you could operate from anywhere in the world, and not have to search for a new job every time you move. You can! Military spouses are some of the most resourceful people we've ever met. And by eliminating the J-O-B (often defined as "Just Over Broke"), you also eliminate some of your larger expenses, like child care, commuting, eating lunch out, and a work wardrobe. There's that much MORE money that stays in your pocket. Are you interested in learning how to turn your hobby into a business? When you own your own business, doing something you enjoy, that passion shows through in your work, and it doesn't really feel like work. Think about becoming your own boss - you deserve it. Let's make it clear that we are not advocating anything that is illegal in any way. All of the tax secrets you will find here are totally legitimate. They have been used for centuries by America's wealthiest families to reduce their income taxes and grow their wealth even faster. Doesn't YOUR family deserve the same? Would you like to receive our updates by e-mail, so you'll be notified when something new has been added to the site? Return to top of Lower Taxes - Legally!.